Trade union representatives use the comic to blame the Nagacorp (3918.HK) for laying off union leaders. Chen Lip Keong is a Malaysian business tycoon with a keen interest in investing in Cambodia, where he is an economic advisor to the Prime Minister himself. 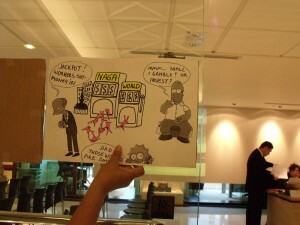 Besides exploiting off-shore oil fields,1 he also set his eyes on a quick and easy profit-making business: gambling! Nagaworld is the name of one of the most prestigious hotels in Phnom Penh, located next to Hun Sen Park. But the hotel is but a side activity to the main business operation. 175 gaming tables and 351 gaming machine stations, of which 36 are dedicated to football betting, operate 24 hours a day, 365 days per year. To get overseas Cambodians and mid-size players from all over the region to the gambling tables, they cooperate with air carriers and airport authorities. From the Cambodian government they could secure a 70-year long license – the longest in Asia, a 40-year monopoly within a 200 km radius of Phnom Penh, and no restriction to expansion. Most importantly, the company pays but a fixed gaming tax per month, irrespective of the revenue, until 2018, subject to an annual increment of 12%. This amounted to 142,383 USD in 2007, while the company revenue reached 144 million USD that year. In comparison, in Macao the gambling business pays up to 40% tax on their revenue.2 An excellent business plan indeed. 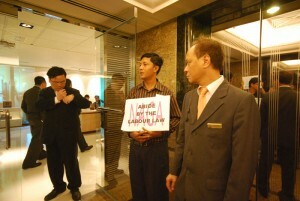 "The Cambodian Tourism and Service Workers Federation (CTSWF), supported by more than 15 Hong Kong groups staged a protest at the door of the Annual General Meeting of NagaCorp (3918.HK) in Hong Kong on 18 May 2008. However, to achieve all this, Chen Lip Keong needed investors’ money. When he failed to list in the Singapore stock exchange for not fulfilling transparency requirements, he came to Hong Kong. Headquarters were set up in 1995 in Hong Kong under the name of “Nagacorp” (3918.HK), while the company itself registered in the Cayman Islands, known for being a tax haven. Having attracted credible directors who could fix some internal weaknesses and provide a clean image, he still needed to convince potential shareholders. Nagacorp attracts investors by promising a high dividend policy (45% in 2008—not surprisingly the CEO holds two thirds of the shares) and “competitive labour costs”—as can be read from their website3. The company employed 2,753 workers at the end of 2008, most of them Cambodians of course, working for an average salary of less than 120 USD per month. That same year the company made a net profit of 40 million USD. True, this is a bit disappointing for the investors as compared to 2007 (over 50 million USD), but this can mainly be attributed to increasing working costs and expansion. Revenues kept on growing, in spite of the financial crisis, and the company’s shares are rated as “buy” according to investment firms. Like many other companies, the financial crisis was good for at least one reason; to allow the company to get rid of the union. "Trade union representatives deliver their demand to the management of Nagacorp, including reinstatement of the unlawfully dismissed of workers. However, Nagacorp vehemently declined this demand. Indeed the Cambodian Tourism and Service Workers Federation (CTSWF) started organizing the workers and monitoring the labour conditions. In spite of the company’s clean image, they found many breaches to the Cambodian Labour Law, so they engaged in a process of collective bargaining Successful on some points, they failed to convince the management to pay correctly for the night shifts, refrain from wage discrimination, or apply leave regulations correctly. Most of all, the union geared up to bargain for higher wages, given the sharp rise in the cost of living in Cambodia due to the food and oil crisis. On February 17, the negotiation process ended in a stalemate: management invoked the financial crisis as reason to disregard the workers’ request. During the Union meeting on 24th of February, workers rejected firmly the reasons brought forward and considered them as an easy pretext. The company was consequently informed the same evening. Two days later, 14 workers, all union activists including the elected union leaders and shop stewards, were dismissed comimmediately on the following grounds: the world financial crisis, retrenchment programme, and “those who are not proven to be productive for the cause of the company”. Most of them were escorted by security personnel and immediately expelled from the compounds. A dismissal letter had already been prepared for them to sign. To the surprise of the workers, the cheque for the termination compensation also comprised last month’s salary, though salaries are normally paid through the bank. When workers refused to accept the cheque, they were asked to choose: take the combined payment by cheque and thus accept termination, or receive nothing, not even salary. For a worker for whom every cent counts, it means a serious threat. This was but one of the many illegal and irregular aspects of termination carried out by the company. CTSWF and the Nagaworld workers decided not to leave it there. They organized protests and rallies, sought solutions with the Ministry of Labour and finally brought the case to the Cambodian Arbitration Council, a tripartite reconciliation body. The company however remained adamant in rejecting the demands. While the council meanwhile already ruled that the management should correctly pay out wages, the case of the dismissal remains unresolved up to date.